The Al-Shouf Cedar Nature Reserve is a popular destination for hiking and trekking, with trails matching all levels of fitness. Bird watching, mountain biking and snow shoeing are also popular. From the summit of the rugged mountains, visitors will have a panoramic view of the countryside, eastward to the Beqaa Valley and Qaraoun Lake, and westward toward the Mediterranean. Government legislation, Law No. 532 of 24 July 1996 declared “The communal lands of Niha, Jbeih, Mreste, Khraibe, Maasser, Barouk, Bmohreh, Ain Dara, Ain Zhalta villages, in addition to the Government owned lands on the eastern side of Barouk Mountain” a Nature Reserve. The Al-Shouf Cedar Nature Reserve is under the authority of the Lebanese Ministry of Environment (MOE), which manages it through the Appointed Protected Area Committee (APAC) that includes among its members the Al-Shouf Cedar Society (ACS), the Mayors of the larger villages, and independent environment experts. APAC liaises with the reserve?s Management Team, which deals with the Reserve?s day-to-day management and planning. The Barouk Water Office has authority over water rights, especially the Barouk water, in the Shouf area. The SBR needs the cooperation of all government and non-government sectors in order to fulfill its goal of conserving the natural and cultural heritage of the region, while also enhancing the well being and income of the inhabitants of the villages surrounding the SBR. This can only be accomplished through the application of laws and regulations across and between the various jurisdictions within the SBR. Twenty four (24) villages surrounding the biosphere from the eastern and western sides of the Barouk and Niha mountains. The SBR lies between longitude 35? 28?- 35? 47? East and latitude 33? 32?- 35? 48? North at an altitude ranging from 1200-1980 meters. It is located along a mountain range comprising the Barouk and Niha Mountains, which is a southern extension of the Mount Lebanon Range. The range runs parallel to the Mediterranean coast. The Beirut-Damascus highway and the town of Jezzine define the north and south borders of the reserve. The western slopes of the range face the Shouf region; the eastern slopes face Mount Hermon and form the western escarpment of the Beqaa Valley. 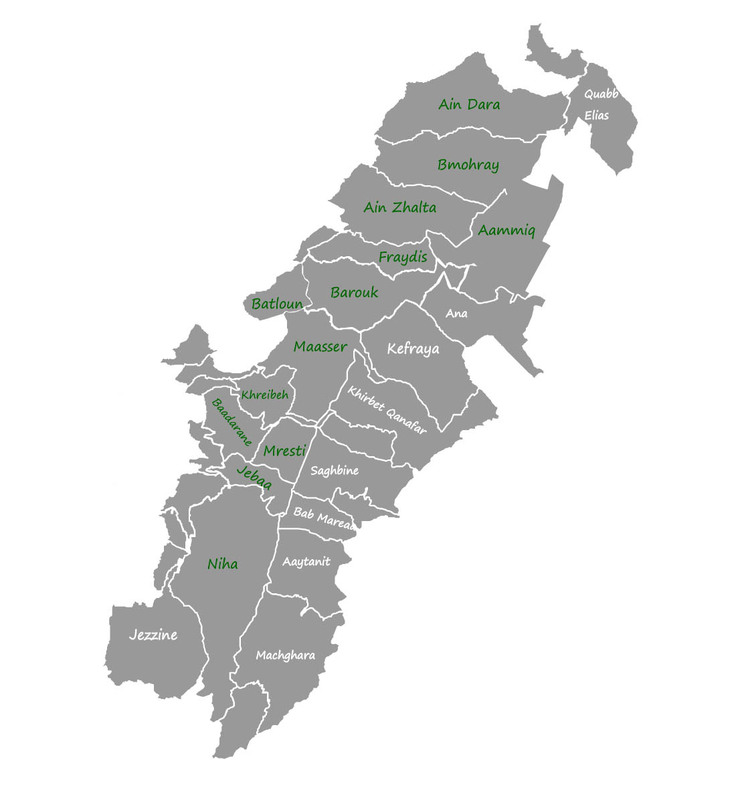 The SBR includes, and is bounded by, twenty two villages: Niha, Jba?a, Mrousti, El Khraibe, Baadaran, Maasser el Chouf, Batloun, Barouk, Ain Zhalta, Bmohray, Ain Dara, Qab Elias, El Safra, Ammiq, Aana, Kefraya, Kherbit Kanafar, Ain Zebde, Saghbine, Bab Mareaa, Aitanit and Machghara. It also includes two protected areas, Al-Shouf Cedar Reserve and Ammiq Wetland, that are fast becoming a major natural attraction for Lebanon and the region. In July 2005, UNESCO declared the Shouf Biosphere Reserve (SBR), a protected area of approximately 50,000 hectare – or 05% of the total area of Lebanon. A large number of local, national, and international stakeholders play an important role in the development of the SBR as supporters, partners, contractors, beneficiaries, and providers of technical and financial assistance. The Management Team of the SBR will convene a series of workshops to present a summary in Arabic of the Biosphere Management Plan 2010-2015. Comments will be noted and incorporated in an addendum to this Management Plan. Biosphere reserves should contain one or more core zones, buffer zones, and a transition zone to accommodate their multiple functions. Core zone of the SBR is about 161 sq km. The main conservation objectives of the core zone are the protection and rehabilitation of the SBR?s natural and cultural values. Buffer zone of the SBR is about 54 sq km. It surrounds the core zone(s) where only activities compatible with the conservation objectives can take place. Transition zone (development zone) of the SBR is about 233 sq km. It includes all the villages surrounding the SBR where sustainable resource management practices are promoted. A world class Biosphere Reserve where natural and cultural heritage are conserved, resources are treated as wealth, investment receives due care, and development is controlled by citizens, businesses, and the managing authority. Why is the SBR important?